Use options on your Android device to specify calls and meetings, contact options, and other overall settings. Depending on how your organization has set up Skype for Business, some of these options might be turned off. To access your settings, tap your picture, and then tap Settings. Enter your Android phone’s mobile number with country/region codes. This lets you make and get work calls, and join meetings from Skype for Business. Also, when Skype for Business cannot use Wi-Fi or the cellular data network to make an audio or video call, you’re called back at this number to connect you to the audio part of the Skype for Business call. When you first sign in to Skype for Business for Android, you’ll be guided to configure your phone number. To update your phone number, on the Settings screen, tap Calls and meetings, tap New Number, and then enter your mobile phone number including the country/region and area code. VoIP always You’ll be connected to audio using VoIP either by using Wi-Fi (if Wi-Fi is available) or your cellular data plan (if Wi-Fi is not available). VoIP over Wi-Fi only You'll be connected to audio using VoIP by using Wi-Fi, and will not use your cellular data plan. If Wi-Fi isn't available, Skype for Business will call you at the phone number you provided. Cellular Skype for Business will call you on your mobile device and you’ll need to accept the Skype for Business call in order to join the meeting. Calls will use your cellular minutes. Normally, Skype for Business for Android won't show meeting content or participant video feeds during a meeting unless you have a Wi-Fi connection. If you turn these options off and aren't connected to Wi-Fi, Skype for Business tries to use your data connection to show screen sharing and video. To change your Wi-Fi settings, on the Settings screen, slide the Require Wi-Fi for video calls switch on or off. Important: Turning off this option can result in higher data charges and difficulty viewing shared content or video, or both. By default, the Exchange credentials option is turned on so all your meeting and voice mail information is shown on Skype for Business. The Exchange setting lets you enter credentials if your Exchange credentials are separate from your Skype for Business settings. If they’re the same, keep it set to On. You need Exchange credentials to show meetings and voice mail. You need HTTP proxy settings if your organization’s network has a proxy that requires credentials setup. You’ll need to enter the domain, user name, and password to sign in and use the application on your organization’s Wi-Fi. You can add Skype for Business contacts to your Android device's phonebook. To do so, on the Settings screen, under Sync contacts, select the check box. To enable or disable the status bar icon for Skype for Business, select or clear the check box. You can turn off sound and vibrate for Skype for Business, or use your device’s sound settings. On the Settings screen, tap Sound, and then select either Use my phone setting or Off. 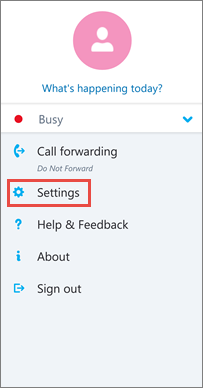 You can turn off vibrate for Skype for Business, or use your device’s sound settings. On the Settings screen, tap Sound, and then select either Use my phone setting or Off. Text telephone (TTY) mode is used to send text over a telephone line. A TTY device must be connected to your mobile device to interpret the modified audio. Otherwise you might experience poor audio quality. Using TTY mode in a conference call might also cause audio quality issues. By default, TTY mode is turned off. To change this setting, on the Settings screen, slide the Accessibility switch on. Logs are used by system administrators to collect, analyze, and save data. A system administrator might ask you to turn on the logging options to do troubleshooting. If you’re not asked, you don’t need to be concerned with this option. To turn on logging, slide to On. To send error logs to your technical support team, tap Send log files, and then enter your support team’s email address. Always Always upload sign-in log on error. Never Never upload sign-in logs. Ask me Prompt user every time there is a sign-in error to upload logs.